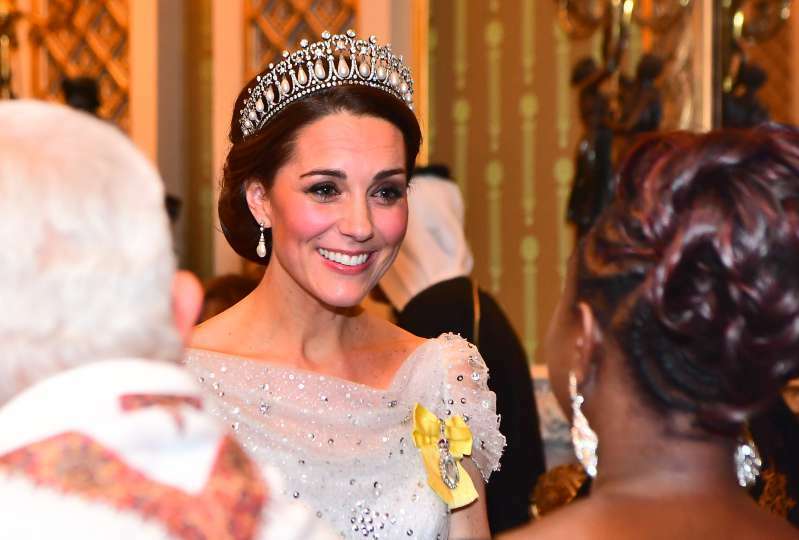 The Duchess of Cambridge was quite the fairytale princess when she attended the Queen's Annual Diplomatic Reception. It's one of those rare moments when royal fans get to see Kate Middleton wearing a tiara. For the first time, the Palace allowed for pictures to be taken at the event, so we got to see Kate's full outfit this year. She stunned in a pale blue fitted bespoke Jenny Packham gown, which featured some crystal embellishments. READ ALSO: Kate Middleton Wears An Unusual Yellow Brooch To The State Dinner: What Is Its Significance? She also graced her gorgeous hair with the Cambridge Lover's Knot tiara. It was all very Cinderella-like. While Kate had our attention, fans did not miss the fact that her sister-in-law, Meghan Markle, was not at the event. Some were looking forward to seeing the Duchess of Sussex at the reception for the first time. While many of the high-ranking members of the royal family were at the Buckingham Palace for the event, Prince Harry and Meghan Markle chose to miss it. That evening, the Duke and Duchess of Sussex attended a carol service which was organized in honor of the Henry van Straubenzee Memorial Fund. The fund provides aid for children's education in Uganda. Sunday Times royal commentator Roya Nikkhah revealed the Sussex's plans on Twitter and posted pictures of the program of events to show that Meghan was listed as a reader. The couple was also pictured leaving the event together. Nikkah's post also mentioned that, even though the Duke of Cambridge was not at the service, he paid tribute to the charity's hard work by sending a written message. Although it may seem like Harry and Meghan ditched the Queen, it's clear that it was a for a very good reason.